Bring the steak to room temperature and slice into medallions. Season each side with salt and pepper. Meanwhile, heat the balsamic vinegar over medium heat. Let this reduce to about 1/4 of its original volume- let it get nice and thick and rich. Heat the olive oil over medium heat in a stainless steel skillet and add the steak medallions once a small wisp of smoke appears above the oil. Sear on each side for 2 minutes or so for rare (120 degrees internal temperature). Serve over the balsamic vinegar and ENJOY! 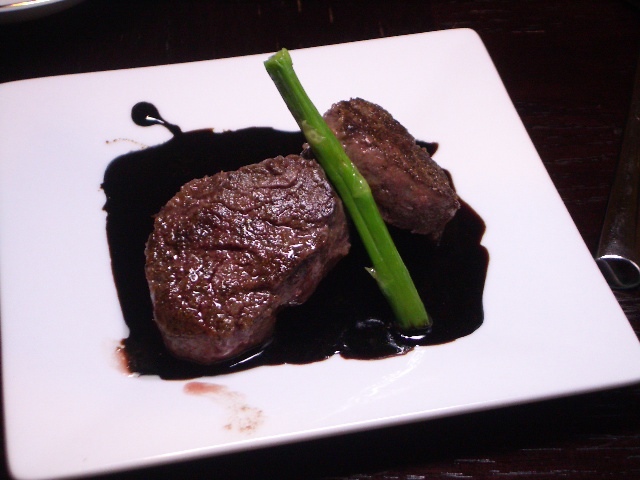 We made the balsamic reduction with steaks last night and it was so tasty!